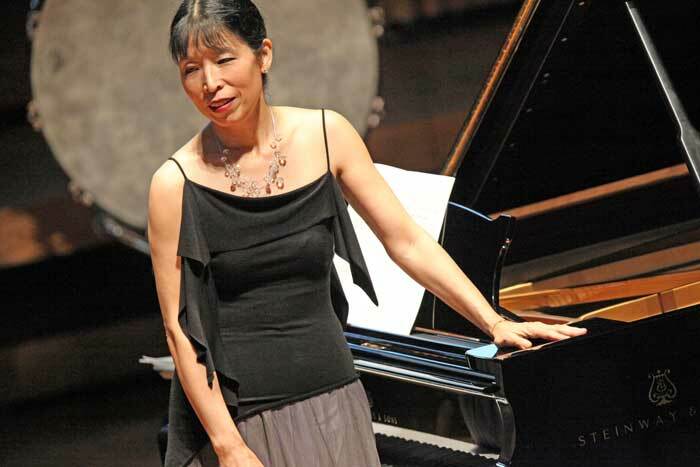 Once again, the 2012 Tanglewood Festival of Contemporary Music chose a work by British composer Harrison Birtwistle to open a program, in this case, Gloria Cheng’s piano recital in Seiji Ozawa Hall on Friday, August 10th. Birtwistle’s Betty Freeman: Her Tango, employed typical tango rhythms in the bass underneath atypically harmonized melodic snippets above. This abstract tango playfully moved along in fits and starts, like nostalgia-tinged snapshots or a dance performance edited by the French New Wave and filled with jump-cuts. Birtwistle was followed by another British composer, George Benjamin. His Shadowlines was an expansive and pensive piece with Impressionistic harmonies and drawn-out gestures that gathered weight like clouds accumulating in the stormy sky outside. This more staid material is continually re-imagined throughout the three sections of Shadowlines, along with insistent and dissonant passages, undulating arpeggios, and heroic low-register motives. Cheng imbued each passage with such deeply felt mystery that even the most subtle phrase was redolent with tension and melancholy. Her skillful organic contrasts brought an elegiac quality to the long goodbye of the second movement and sensuousness to the final movement’s melodic inclinations. Oliver Knussen’s contribution to the program was the poignantly lovely Ophelia’s Last Dance. Arcane arpeggios across the whole register range of the piano resolved into a waltz-style melody and accompaniment imbued with nostalgia and a sense of innocence. The stormy middle section provided a contrasting feeling of expansiveness. When the waltz theme returned, this recent disturbance added twists and turns to the initial theme, keeping the piece fresh from start to finish, despite it’s nod to old-fashioned forms. A set of six preludes by Bernard Rands all drew on similar textural constructions and motivic material, and in that sense could be mistaken for theme and variations. The first prelude, Durezza, laid out the basic premise for the whole set: strong and stately middle-registered themes answered in ever-expanding chords above and below like a brightening halo. The fourth prelude, Notturno, dedicated to composer Donald Martino, was my favorite. Here, a simple theme built on repeated notes was surrounded by widely spaced high and low sonorities that seemed to define a sonic space of cosmic dimensions and beauty. Cheng imbued this seemingly static sound world with undercurrents of bittersweet drama. The second half of the concert began with John Harbison’s Leonard Stein Anagrams, a set of 12-plus-one miniatures dedicated to the eponymous and triskaidekaphobic Los Angeles pianist. If this set is an accurate portrait of the man, he must have been a giant of a musician with a wicked sense of play. These charming and mild miniatures ran the gamut from playful to stark, energetic syncopation to gentle lullaby. The final piece, numbered 12A so as to avoid the dreaded 13 (his triskaidekaphobia), was perhaps the most outwardly clever, continually iterating cadential gestures that, despite their earnestness, always ended on an ambiguous harmony, leading the listener to believe that there is more to this musical portrait than can be contained. Esa-Pekka Salonen rounded out the program with a set of two perpetual-motion pieces under the title Dichotomie. The first of the pair, Mécanisme, was an exploration of mechanical motion as manifested by repeated staccato notes. Salonen managed to capture the feeling of early Machine-Age artistic enthusiasm for technology. Perpetual motion can be numbing, and like machines themselves, Mécanisme attracted the most interest when its rhythms devolved into irregularity or when they were interrupted by flourishes and dramatic glissandi. While the piece may have been too long, Cheng never flagged and kept the motion crisp all the way to the end. The second section, Organisme, brought to mind undulating water or the rustling of trees. Here Cheng allowed the motion to blur into a lovely wash, as if it were the foundation of a watercolor landscape. Out of this flutter emerged some lovely melodies that kept the overall harmony from becoming mired in stasis. The final, ascending gesture, rendered ever-so-sweetly by Cheng, left the listener believing that Salonen’s organic motion was continuing on into infinity somewhere beyond our consciousness. Stefanie Lubkowski is a composer and doctoral candidate at Boston University. She is very active in the Boston new-music scene and sits on the board of the New Gallery Concert Series.